Average Wind at 33 ft (10 m) in mph -- A wind barb system is used. A half barb along the staff represents 5 mph; a full barb, 10 mph; and a flag, 50 mph. One adds them up to get the total average wind speed. Winds blow in a direction along the staff from the barbed end to the station dot. Calm winds are depicted by an open circle around the station dot. Wind Gusts at 33 ft (10 m) in mph (upper right of station dot in purple). Wind gusts are only shown for gusts >= 20 mph; they are depicted by "Gnn", where nn is the wind gust speed. The Relative Humidity and Winds map displays the current relative humidity at 1.5 m (5 ft), displayed in percent (%), at each Mesonet site, as well as the 10-m average wind conditions across Oklahoma. Relative humidity (RH) indicates the percentage of water vapor that the air is currently holding (with respect to its maximum holding capacity at the current temperature). RH is the most critical weather variable for fire behavior, as a lower relative humidity leads to lower dead fuel moisture, especially in the 1-hour and 10-hour fuels. The 10-m (33 ft) winds are represented by wind vectors (arrows) whose lengths are proportional to the wind speed and which point in the direction toward which the wind is blowing. This map is updated every 5 minutes. The 3-hour Relative Humidity Change map plots the change in relative humidity (%) at each Mesonet station over the past 3 hours. This map is updated every 5 minutes. This map depicts the maximum relative humidity (%) occurring since midnight. This information is useful to see if fuel recovery for 1- and 10-hour dead fuels has had a chance to occur in the overnight hours before sunrise. This map is updated every 5 minutes. The Wind Gusts map displays the highest 10-m (33 ft) wind gust (in mph) recorded at each Mesonet station in the past five minutes. This map is updated every 5 minutes. The 2-meter Winds map displays the average wind speeds (in mph) at 2 m (6.5 ft) above the surface. Wind directions at 10-m (33 ft) height are also shown and depicted by wind vectors (arrows) whose lengths are proportional to the wind speed and which point in the direction toward which the wind is blowing. This map is updated every 5 minutes. The Air Temperature map plots the current air temperature (degrees F) at the standard height of 1.5 m (5 feet). When temperatures are below freezing, a line will delineate the areas of the state that are above and below freezing. This map is updated every 5 minutes. The Dewpoint Temperature map displays the current dewpoint temperature (degrees F) observed at each Mesonet site. Dewpoint is the temperature to which air must be cooled for saturation to occur (given a constant pressure and water vapor content). Current Temperature (degrees F) if neither wind chill or heat index is a factor. Difference between the 30 ft and 5 ft Air Temperature in degrees F (upper right of station dot); red (> 0F) if there is an inversion, blue (<= 0F) if there is not an inversion. During the daytime, air temperature usually decreases with height above the surface (no inversion). During nights with clear to mostly cloudy skies and light winds, air temperature usually increases with height above the surface (inversion conditions). This map is updated every 5 minutes. The Oklahoma Radar map is a composite of all radars in Oklahoma. When temperatures are below freezing, a line will delineate the areas of the state that are above and below freezing. The unit dBZ is a measure of the radar reflectivity factor, which indicates the intensity of the precipitation on the map. The higher the dBZ value, the more intense is the precipitation. The 1-hour Rainfall Accumulation map displays accumulated rainfall observed at each Mesonet site in the last hour. This map also displays the NWS River Forecast Center's rainfall estimates (in color) across Oklahoma based on radar. During precipitation events involving ice, hail, or snow, the rain gauges used by the Oklahoma Mesonet may freeze over and record no rainfall. Once air temperatures raise enough to allow thawing, accumulated frozen precipitation in the gauge will melt and be recorded. The 24-hour Rainfall Accumulation map displays accumulated rainfall observed at each Mesonet site in the last 24 hours. 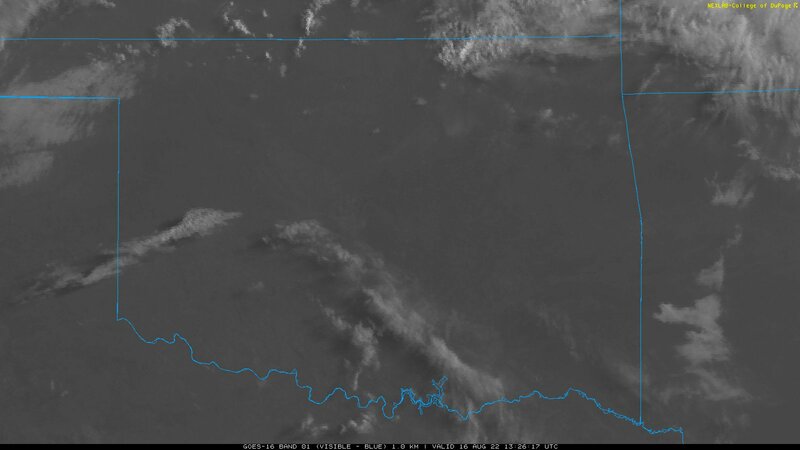 This map also displays the NWS River Forecast Center's rainfall estimates (in color) across Oklahoma based on radar. During precipitation events involving ice, hail, or snow, the rain gauges used by the Oklahoma Mesonet may freeze over and record no rainfall. Once air temperatures raise enough to allow thawing, accumulated frozen precipitation in the gauge will melt and be recorded. BI < 40 (FL < 4 ft): Fires can generally be attacked at the head or flanks by persons using hand tools. Hand line should hold the fire. BI = 40-80 (FL = 4-8 ft): Fires are too intense for direct attack on the head by persons using hand tools. Hand line cannot be relied on to hold fire. Equipment such as dozers, pumpers, and retardant aircraft can be effective. BI = 80-110 (FL = 8-11 ft): Fires may present serious control problems – torching out, crowning, and spotting. Control efforts at the fire head will probably be ineffective. BI > 110 (FL > 11 ft): Crowning, spotting, and major fire runs are probable. Control efforts at the head of the fire are ineffective. Burning index is a function of the fuel model being used, the live and dead fuel moistures, and the weather conditions. If the fuel types and loads are substantially different than those in the fuel model being used, there will be inaccuracies. Finally, it is important to realize that these indices produced by the National Fire Danger Rating system are for the conditions modeled at 1-km resolution. In other words, the fuel model represents conditions over the entire 1-km square area, so indices such as BI are not meant to be used on a field-by-field basis. As an example, if the particular fuel in the area of concern (e.g., a particular field) differs from the assigned fuel model in that 1-km square, then the Oklahoma Fire Danger Model results for that square can be expected to be different than for the particular field in question (e.g., an open grassy area in a 1-km square that has been assigned a forest fuel model). 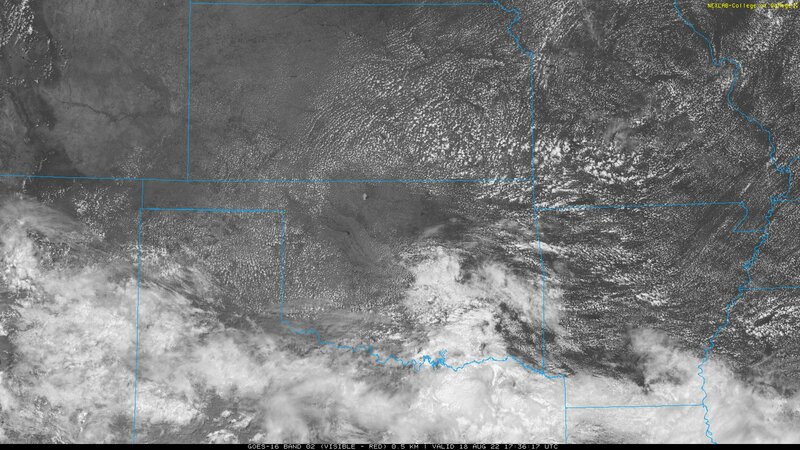 Other limitations of the model can be found in the document entitled The Oklahoma Fire Danger Model. The energy release component (ERC) is a measure of the available energy (BTU/square foot) released per unit area in the flaming zone at the head of the fire. It is the least variable of the indices on a day-to-day basis, being a function solely of the fuels (and their moisture content, which is weather-dependent). ERC is another index produced by the Oklahoma Fire Danger Model. Conditions producing an ERC value of 24 represent a potential heat release twice that of conditions resulting in an ERC value of 12. Since ERC represents the potential “heat release” per unit area in the flaming zone, it can provide guidance to several important fire activities. It may also be considered a composite fuel moisture value as it reflects the contribution that all live and dead fuels have to potential fire intensity. Especially for fuel complexes containing the heavier 100- and 1000-hour fuels, the ERC is a cumulative or “build-up” type of index. As live fuels cure and dead fuels dry, the ERC values get higher, thus providing a good reflection of drought conditions. ERC is a function of the fuel model being used, the live and dead fuel moistures, and the weather conditions. If the fuel types and loads are substantially different than those in the fuel model being used, there will be inaccuracies. The 1-hr Dead Fuel Moisture map displays the % moisture content on a dry-weight basis of 1-hour dead fuels as calculated by a calibrated version of the Nelson dead fuel moisture model. Calculated values can range from 1% to 85%. One-hour fuels are the fine dead fuels (< 0.25”) such as grasses which are often involved in the initiation and maintenance of wildland fires and whose moisture contents respond quickly (within minutes) to changing weather conditions. These dead fuels include herbaceous plants, roundwood, and also the uppermost layer of litter on the forest floor. For prescribed fire, the preferred range of 1-hour dead fuel moisture is from 7 to 20%. Below 7%, spot fires become a problem and above 20% there will be problems in starting and maintaining the fire due to too much moisture in the fine fuels. To understand the influence of 1-hour dead fuel moisture on prescribed burning and wildfire, consult OK-FIRE Basics for Prescribed Burning and OK-FIRE Basics for Fire Danger. The 10-hr Dead Fuel Moisture map displays the % moisture content on a dry-weight basis of 10-hour dead fuels as calculated by a calibrated version of the Nelson dead fuel moisture model. Calculated values can range from 1% to 60%. Ten-hour fuels are the smaller diameter dead fuels in the 0.25" to 1" diameter range. They also respond quickly to changing weather conditions, but not as quickly as do 1-hour fuels. These fuels include roundwood and the layer of litter on forest floors extending, roughly, from 0.25" below the surface to 1" deep. For prescribed fire, the preferred range of 10-hour dead fuel moisture is from 6 to 15%. Below 6%, spot fires become a problem and above 15% there will be problems in maintaining the fire due to too much moisture in the 10-hour fuels. To understand the influence of 10-hour dead fuel moisture on prescribed burning and wildfire, consult OK-FIRE Basics for Prescribed Burning and OK-FIRE Basics for Fire Danger. The 100-hr Dead Fuel Moisture map displays the % moisture content on a dry-weight basis of 100-hour dead fuels as calculated by a calibrated version of the Nelson dead fuel moisture model. Calculated values can range from 1% to 40%. 100-hour fuels include roundwood with diameters of 1-3" as well as organic materials beneath the surface at roughly 1-4" depths. 100-hour fuels respond more slowly than 10-hour fuels to changing weather conditions and are better indicators for extended dry or wet periods. Low 100-hr dead fuel moisture during the growing season is often associated with increased summer wildfire activity. This map is updated every hour. The 1000-hr Dead Fuel Moisture map displays the % moisture content on a dry-weight basis of 1000-hour dead fuels as calculated by a calibrated version of the Nelson dead fuel moisture model. Calculated values can range from 1% to 32%. 1000-hour fuels include roundwood with diameters of 3-8" as well as organic materials beneath the surface at roughly 4-12" depths. 1000-hour fuels respond more slowly than 100-hour fuels to changing weather conditions and are excellent indicators of extended dry or wet periods. Low 1000-hr dead fuel moisture during the growing season is indicative of drought and usually associated with increased summer wildfire activity. This map is updated every hour. The Live Herbaceous Moisture map displays the % moisture content on a dry-weight basis of live herbaceous fuels (e.g., grasses, forbs, ferns). In contrast to dead fuels, live herbaceous fuels have some greenness showing and moisture content is controlled largely by physiological processes within the plant (e.g., green-up in the spring, senescence in the fall). Because live fuels consist mainly of water, fuel moisture values can go well over 100%. Low soil moisture can cause these fuels to decrease in fuel moisture and eventually convert to dead 1-hour fuels. Live herbaceous moisture is crudely modeled as a function of relative greenness for each 1-km square pixel of land and can range from 0-200%. This map is updated every Tuesday when the new weekly satellite data is processed. The Live Woody Moisture map displays the % moisture content on a dry-weight basis of live woody fuels. Woody fuels are divided into evergreen and deciduous, and refer to the leaves, needles, and twigs of woody shrubs and trees. In contrast to dead fuels, live woody fuels contain some greenness and moisture content is controlled largely by physiological processes within the plant. Deciduous live woody fuels go through an annual cycle, at the end of which the leaves and twigs become dead fuels for purposes of fire danger modeling. During the growing season, low soil moisture can cause these deciduous fuels to decrease in fuel moisture and can cause evergreen fuels to decrease in fuel moisture anytime throughout the year. Because live fuels consist mainly of water, fuel moisture values can go well over 100%. Live woody moisture is crudely modeled as a function of relative greenness for each 1-km square pixel of land and can range from 70-160%. This map is updated every Tuesday when the new weekly satellite data is processed. Visual Greenness (VG) ranges from 0-100% and indicates how green each 1-km square pixel of land is in relation to a standard reference such as a highly green agricultural field. A given VG value represents the same level of greenness no matter where it occurs in the state. A value of 100% represents the highest greenness level and 0%, the lowest greenness level. 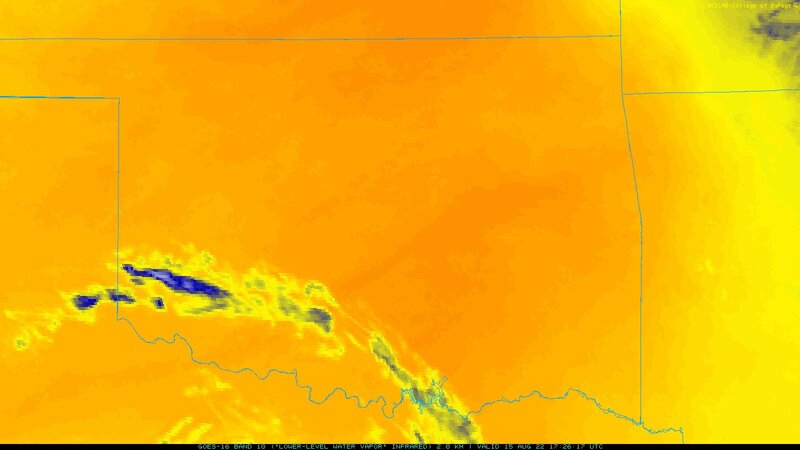 VG is calculated from weekly composite satellite imagery (AVHRR) using NDVI (Normalized Difference Vegetation Index) and is updated on OK-FIRE every Tuesday. If a given pixel is cloudy during the entire weekly period, the VG value is not calculated and the pixel appears light blue on the VG map. 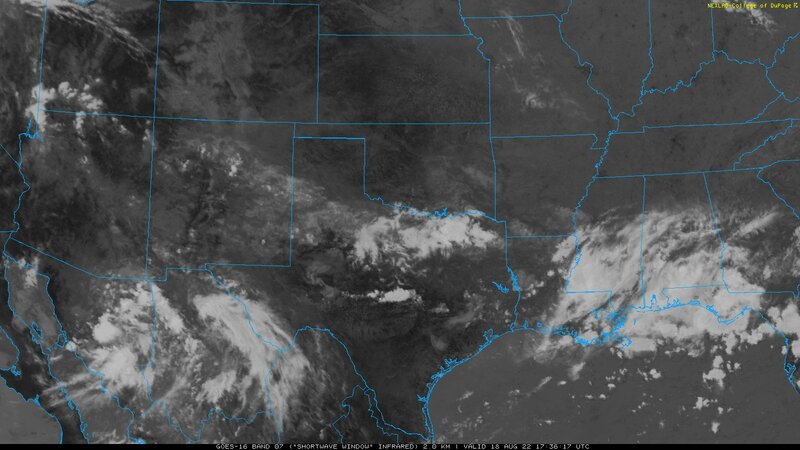 This satellite image displays the shortwave infrared wavelength band (band 7) from the GOES-16 satellite. This is a particular wavelength band (centered at 3.9 microns) that is very useful for detecting wildland fires (wildfires or prescribed fires). Fires appear as distinct black areas (often dots) against the usual gray background. Clouds are depicted in whites and will usually obscure any surface fires. The map, useful during day or night, has a spatial resolution of 2 km with a central wavelength of 3.9 microns. This image is provided by the College of DuPage and is updated every 5 minutes. The time of the image is shown beneath the map in UTC time (CST = UTC - 6 hours; CDT = UTC - 5 hours). Click here to see an animation of this map with county boundaries over the past four hours. More information about this particular wavelength band and its uses can be found here. This satellite image displays the "blue" wavelength band (band 1), one of two visible bands from the GOES-16 satellite. 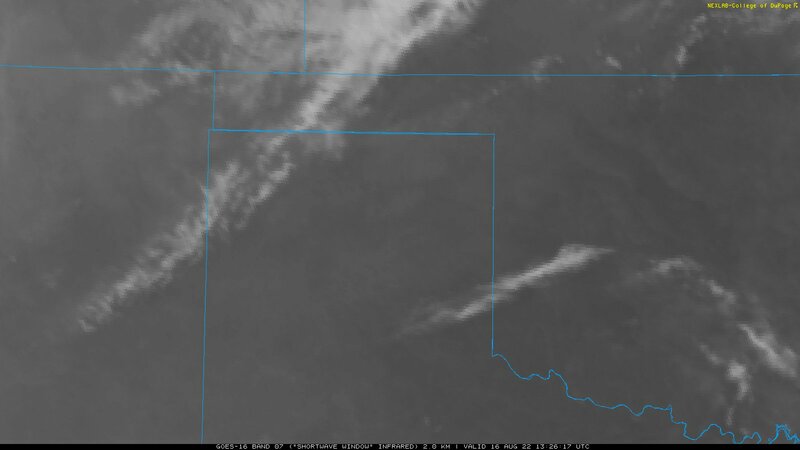 During the daytime this map is particularly useful for seeing smoke plumes from wildfires as there is greater contrast between the smoke and the background than in the "red" visible wavelength band (band 2). The map has a spatial resolution of 1 km with a central wavelength of 0.47 microns. This image is provided by the College of DuPage and is updated every 5 minutes. The time of the image is shown beneath the map in UTC time (CST = UTC - 6 hours; CDT = UTC - 5 hours). Click here to see an animation of this map with county boundaries over the past four hours. More information about this particular visible band and its uses can be found here. This satellite image displays the"red" wavelength band (band 2), one of two visible bands from the GOES-16 satellite. During the daytime this map is particularly useful for seeing surface features and clouds; it is the traditional "visible" map. The map has a spatial resolution of 500 m with a central wavelength of 0.64 microns. This image is provided by the College of DuPage and is updated every 5 minutes. The time of the image is shown beneath the map in UTC time (CST = UTC - 6 hours; CDT = UTC - 5 hours). Click here to see an animation of this map with county boundaries over the past four hours. More information about this particular visible band and its uses can be found here. 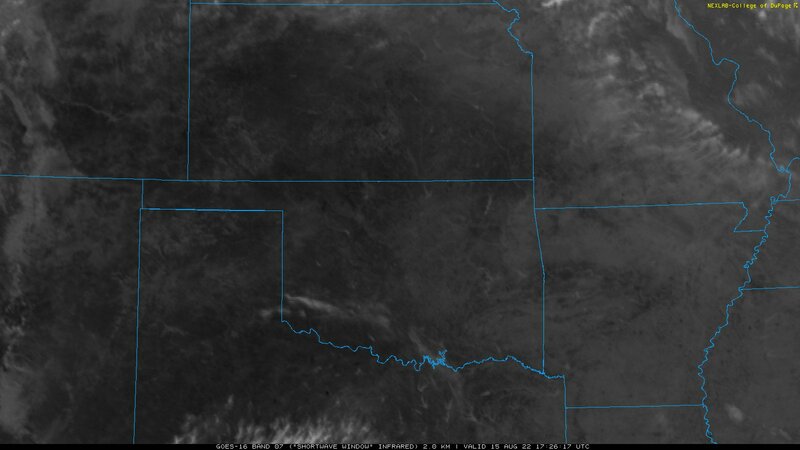 This satellite image displays the "red" wavelength band (band 2), one of two visible bands from the GOES-16 satellite. During the daytime this map is particularly useful for seeing surface features and clouds; it is the traditional "visible" map. The map has a spatial resolution of 500 m with a central wavelength of 0.64 microns. This image is provided by the College of DuPage and is updated every 5 minutes. The time of the image is shown beneath the map in UTC time (CST = UTC - 6 hours; CDT = UTC - 5 hours). Click here to see an animation of this map with county boundaries over the past four hours. More information about this particular visible band and its uses can be found here. 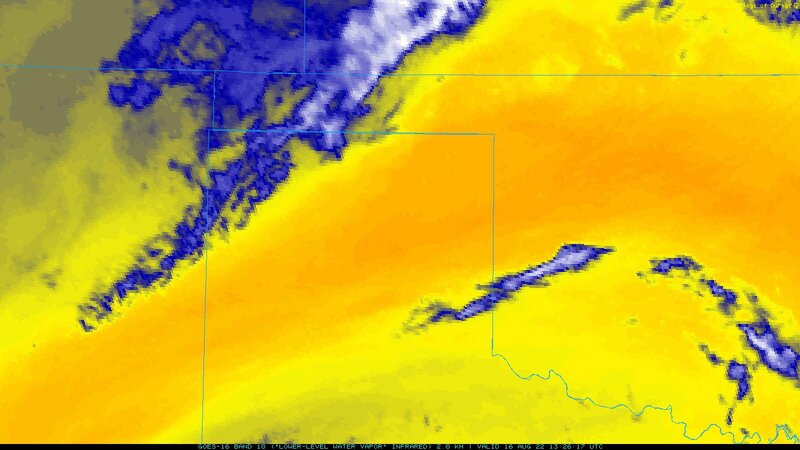 This satellite image displays the lower-level water vapor wavelength band (band 10) of the three water vapor bands from the GOES-16 satellite. 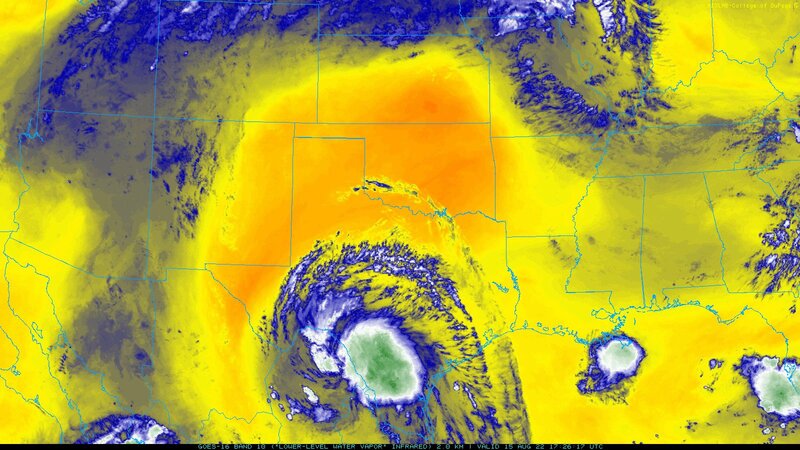 The water vapor depicted by this particular band is typically at a pressure level around 700 millibars (approximately 10,000 feet). 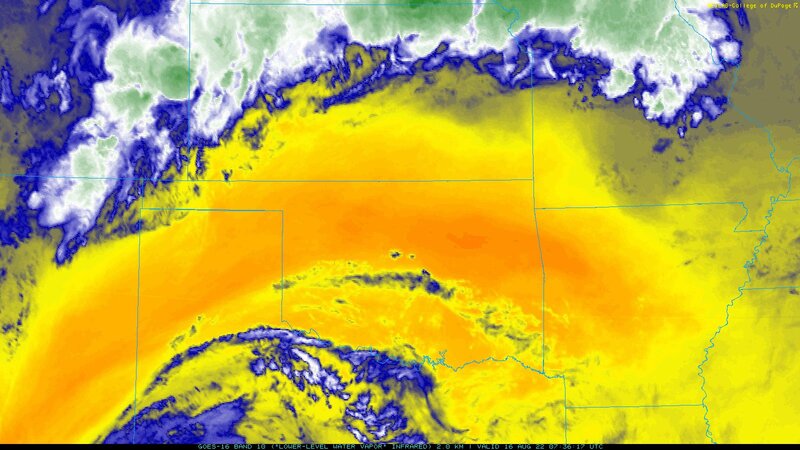 With sufficient surface- based convection, dry air (oranges/reds) at this level can often be translated to the surface, resulting in very low relative humidity and increased fire danger. The map, useful during day or night, has a spatial resolution of 2 km with a central wavelength of 7.3 microns. This image is provided by the College of DuPage and is updated every 5 minutes. The time of the image is shown beneath the map in UTC time (CST = UTC - 6 hours; CDT = UTC - 5 hours). Click here to see an animation of this map with county boundaries over the past four hours. More information about this particular wavelength band and its uses can be found here. This radar image from Amarillo shows the current base reflectivity at a 0.5 degree upward tilt of the radar beam. Local radar can be useful, as can satellite imagery in the visible, in detecting smoke plumes from wildland fire. However, the radar beam has to intersect the smoke plume for the plume to be detected, meaning lower-level smoke plumes are more difficult to detect the further the distance from the radar site due to the upward tilt of the radar beam. During non-precipitation conditions, this map is updated approximately every 10 minutes, but during precipitation events the updates can be as frequent as every 2 to 3 minutes. To view a 24-frame past animation (4-hours under non-precipitation conditions) of this local radar map, click here. These animated maps are provided by the College of DuPage, with the time of each image shown beneath the map in UTC time (CST = UTC - 6 hours; CDT = UTC - 5 hours). 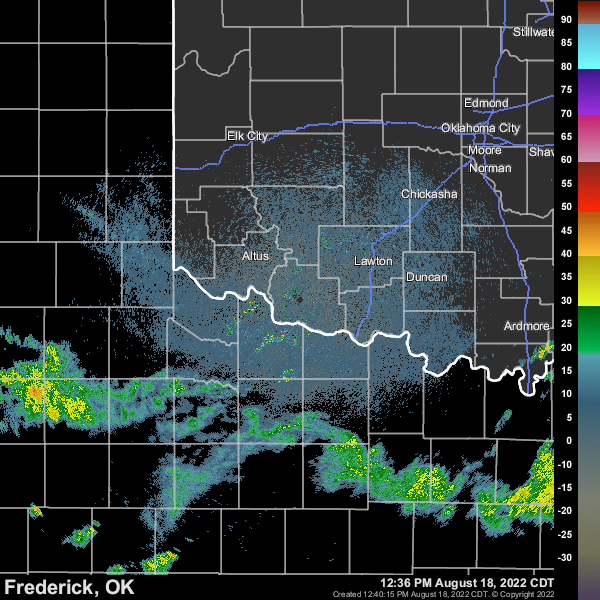 This radar image from Oklahoma City shows the current base reflectivity at a 0.5 degree upward tilt of the radar beam. Local radar can be useful, as can satellite imagery in the visible, in detecting smoke plumes from wildland fire. However, the radar beam has to intersect the smoke plume for the plume to be detected, meaning lower-level smoke plumes are more difficult to detect the further the distance from the radar site due to the upward tilt of the radar beam. During non-precipitation conditions, this map is updated approximately every 10 minutes, but during precipitation events the updates can be as frequent as every 2 to 3 minutes. To view a 24-frame past animation (4-hours under non-precipitation conditions) of this local radar map, click here. These animated maps are provided by the College of DuPage, with the time of each image shown beneath the map in UTC time (CST = UTC - 6 hours; CDT = UTC - 5 hours). 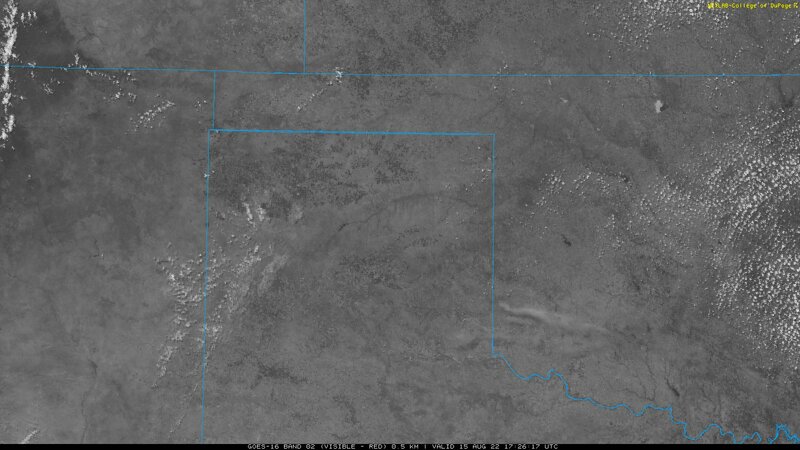 This radar image from Tulsa shows the current base reflectivity at a 0.5 degree upward tilt of the radar beam. Local radar can be useful, as can satellite imagery in the visible, in detecting smoke plumes from wildland fire. However, the radar beam has to intersect the smoke plume for the plume to be detected, meaning lower-level smoke plumes are more difficult to detect the further the distance from the radar site due to the upward tilt of the radar beam. During non-precipitation conditions, this map is updated approximately every 10 minutes, but during precipitation events the updates can be as frequent as every 2 to 3 minutes. To view a 24-frame past animation (4-hours under non-precipitation conditions) of this local radar map, click here. These animated maps are provided by the College of DuPage, with the time of each image shown beneath the map in UTC time (CST = UTC - 6 hours; CDT = UTC - 5 hours). This radar image from Dodge City shows the current base reflectivity at a 0.5 degree upward tilt of the radar beam. 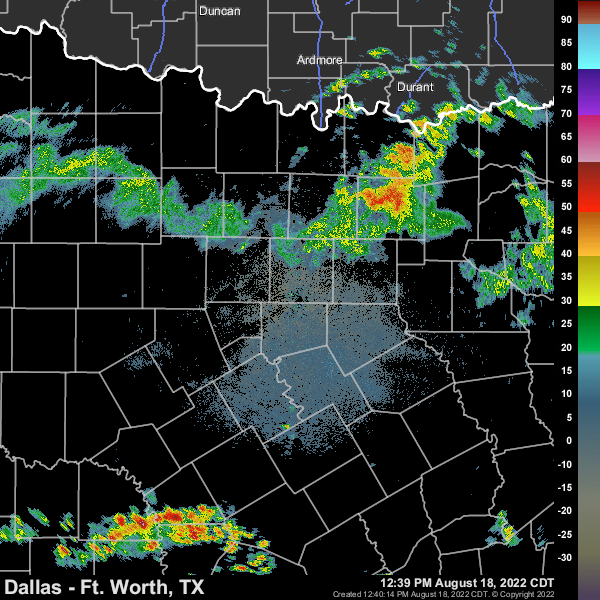 Local radar can be useful, as can satellite imagery in the visible, in detecting smoke plumes from wildland fire. However, the radar beam has to intersect the smoke plume for the plume to be detected, meaning lower-level smoke plumes are more difficult to detect the further the distance from the radar site due to the upward tilt of the radar beam. During non-precipitation conditions, this map is updated approximately every 10 minutes, but during precipitation events the updates can be as frequent as every 2 to 3 minutes. To view a 24-frame past animation (4-hours under non-precipitation conditions) of this local radar map, click here. These animated maps are provided by the College of DuPage, with the time of each image shown beneath the map in UTC time (CST = UTC - 6 hours; CDT = UTC - 5 hours). This radar image from Vance Air Force Base shows the current base reflectivity at a 0.5 degree upward tilt of the radar beam. Local radar can be useful, as can satellite imagery in the visible, in detecting smoke plumes from wildland fire. However, the radar beam has to intersect the smoke plume for the plume to be detected, meaning lower-level smoke plumes are more difficult to detect the further the distance from the radar site due to the upward tilt of the radar beam. During non-precipitation conditions, this map is updated approximately every 10 minutes, but during precipitation events the updates can be as frequent as every 2 to 3 minutes. To view a 24-frame past animation (4-hours under non-precipitation conditions) of this local radar map, click here. These animated maps are provided by the College of DuPage, with the time of each image shown beneath the map in UTC time (CST = UTC - 6 hours; CDT = UTC - 5 hours). 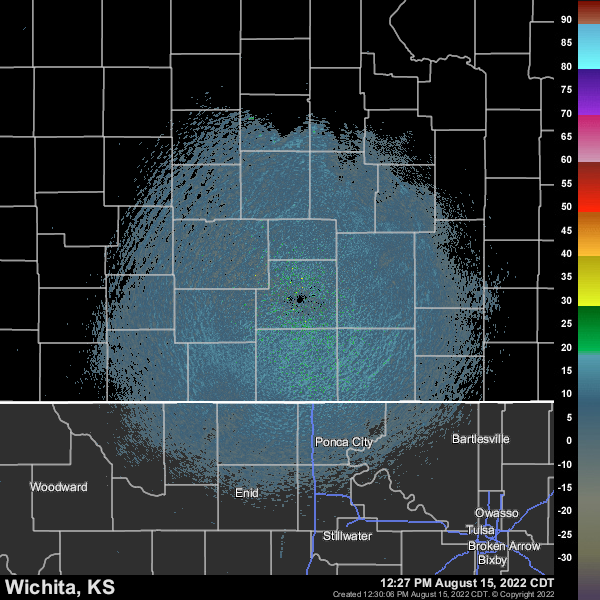 This radar image from Wichita shows the current base reflectivity at a 0.5 degree upward tilt of the radar beam. 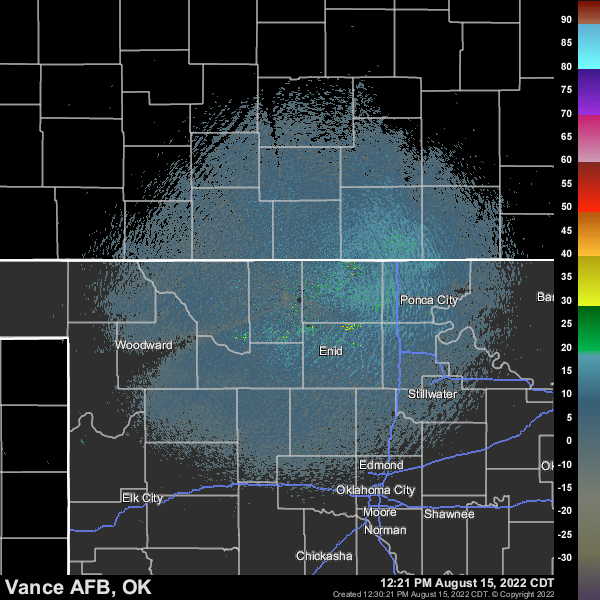 Local radar can be useful, as can satellite imagery in the visible, in detecting smoke plumes from wildland fire. However, the radar beam has to intersect the smoke plume for the plume to be detected, meaning lower-level smoke plumes are more difficult to detect the further the distance from the radar site due to the upward tilt of the radar beam. During non-precipitation conditions, this map is updated approximately every 10 minutes, but during precipitation events the updates can be as frequent as every 2 to 3 minutes. To view a 24-frame past animation (4-hours under non-precipitation conditions) of this local radar map, click here. These animated maps are provided by the College of DuPage, with the time of each image shown beneath the map in UTC time (CST = UTC - 6 hours; CDT = UTC - 5 hours). This radar image from Frederick shows the current base reflectivity at a 0.5 degree upward tilt of the radar beam. 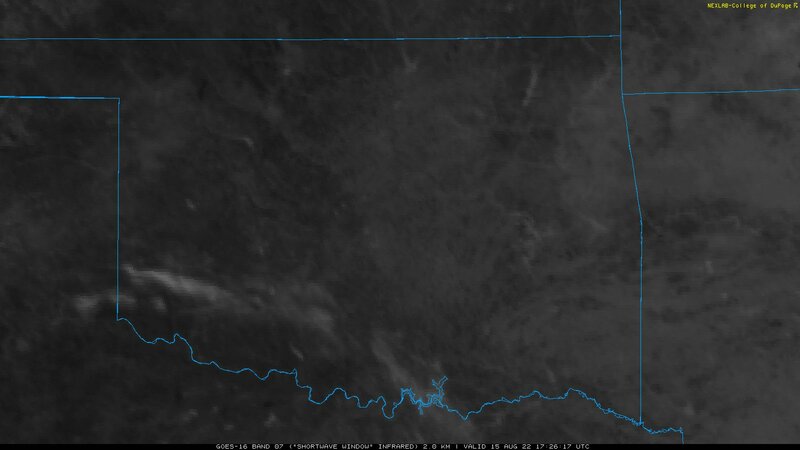 Local radar can be useful, as can satellite imagery in the visible, in detecting smoke plumes from wildland fire. However, the radar beam has to intersect the smoke plume for the plume to be detected, meaning lower-level smoke plumes are more difficult to detect the further the distance from the radar site due to the upward tilt of the radar beam. During non-precipitation conditions, this map is updated approximately every 10 minutes, but during precipitation events the updates can be as frequent as every 2 to 3 minutes. To view a 24-frame past animation (4-hours under non-precipitation conditions) of this local radar map, click here. These animated maps are provided by the College of DuPage, with the time of each image shown beneath the map in UTC time (CST = UTC - 6 hours; CDT = UTC - 5 hours). This radar image from Dallas/Fort Worth shows the current base reflectivity at a 0.5 degree upward tilt of the radar beam. 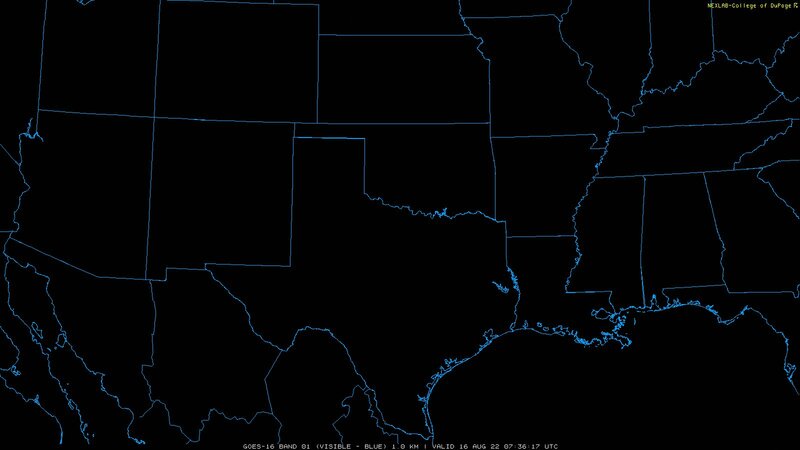 Local radar can be useful, as can satellite imagery in the visible, in detecting smoke plumes from wildland fire. However, the radar beam has to intersect the smoke plume for the plume to be detected, meaning lower-level smoke plumes are more difficult to detect the further the distance from the radar site due to the upward tilt of the radar beam. During non-precipitation conditions, this map is updated approximately every 10 minutes, but during precipitation events the updates can be as frequent as every 2 to 3 minutes. To view a 24-frame past animation (4-hours under non-precipitation conditions) of this local radar map, click here. These animated maps are provided by the College of DuPage, with the time of each image shown beneath the map in UTC time (CST = UTC - 6 hours; CDT = UTC - 5 hours). 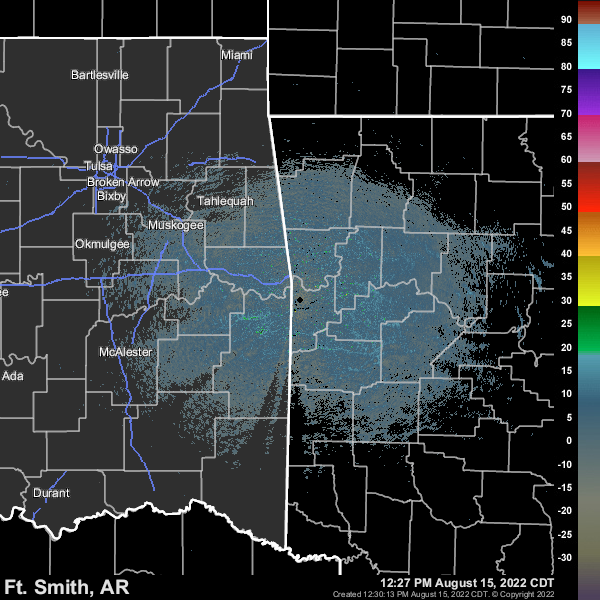 This radar image from Fort Smith shows the current base reflectivity at a 0.5 degree upward tilt of the radar beam. Local radar can be useful, as can satellite imagery in the visible, in detecting smoke plumes from wildland fire. However, the radar beam has to intersect the smoke plume for the plume to be detected, meaning lower-level smoke plumes are more difficult to detect the further the distance from the radar site due to the upward tilt of the radar beam. During non-precipitation conditions, this map is updated approximately every 10 minutes, but during precipitation events the updates can be as frequent as every 2 to 3 minutes. To view a 24-frame past animation (4-hours under non-precipitation conditions) of this local radar map, click here. These animated maps are provided by the College of DuPage, with the time of each image shown beneath the map in UTC time (CST = UTC - 6 hours; CDT = UTC - 5 hours).